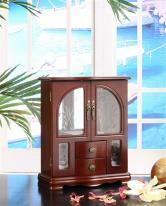 An oak jewelry box or chest crafted in the timeless beauty of this favorite wood will blend with many styles of decor. Choose from splendidly detailed dresser top chests, floor standing armoires and watch boxes in warm oak finishes. If you don't see the oak jewelry boxes or jewelry chests you are looking for, give us a call or send an email. We're here to help. 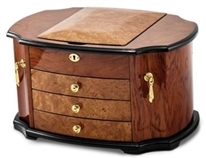 All oak jewelry boxes qualify for 1 year product warranties and 30 day easy returns.